...Like Kraut in a Barrel. Was it Max Baer who uttered that classic boxing line? Not sure. 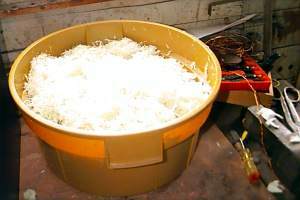 Anyway, this tub full of cabbage when salted and pounded down will make for about 3 inches of depth in our crock. And the crock is about 32 inches high. Keep the shredder going!